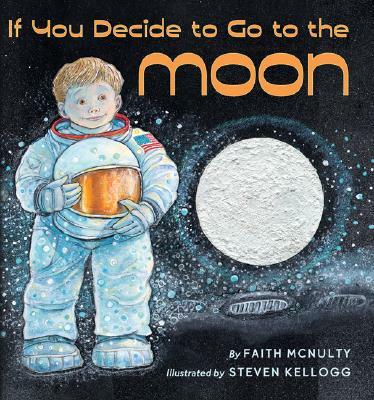 We have been reading If you Decide to Go to the Moon, written by Faith McNulty and illustrated by Steven Kellogg. It begins: If you decide to go to the moon in your own rocket ship, read this book before you start. We are taken on a journey (on a rocket ship 🙂 ) to the moon and back and learn all kinds of cool things about travelling in space and important facts about the moon along the way. 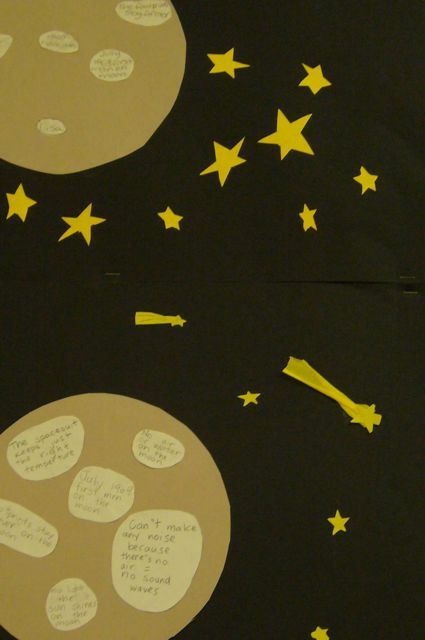 We represented our learning with large space pictures including stars, rockets and the sun. Facts and questions about the moon were included as fact craters or question craters and glued onto our pictures (inside the moons). Some key facts we learned today? We also learned some pretty neat things about what it is like for astronauts to travel to the moon. Did you know it takes two and a half days to get there (by rocket)? Many people think it would be fun to try and walk on the moon where there is such little gravity. We found it fascinating that astronauts’ footprints stay on the moon forever because there is no wind or rain to wear them away. Most of all though, everyone wanted to look back to Earth from the moon and see what it would look like. Maybe some of us are future astronauts and will get that opportunity . . . .? A fantastic book as an introduction to the moon and space travel. 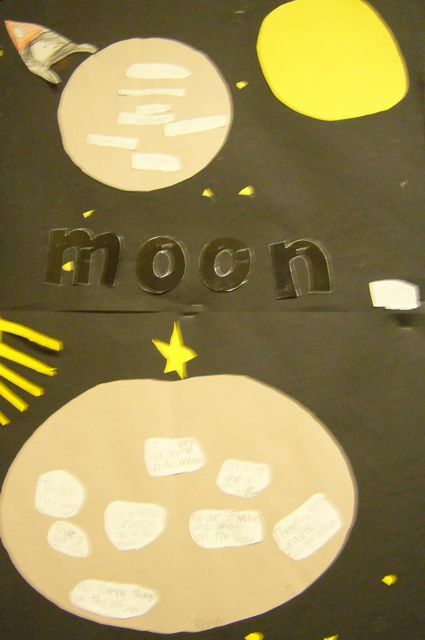 This entry was posted in Non-fiction and tagged favourite illustrators, information story books, moon, observations, picture books, space by carriegelson. Bookmark the permalink. I love their art! I saw it in the hall yesterday when one of your colleagues was showing me what great work your class had done!